Date: Sunday 6 November 2016? *This seminar will be held on Sunday. 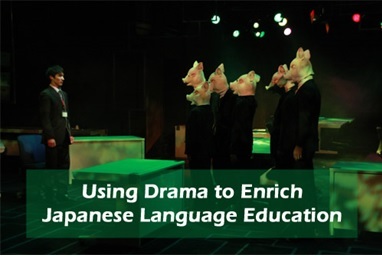 * The event is aimed at teachers of Japanese as well as advanced learners of Japanese who are interested in theatre. It is possible to only attend the first half of the event. Information on the Japan Foundation website: click here. Please make sure that you resister for participation as well as paying the fee by Paypal. Paypal administration fee is included. Lunch is optional, with an additional fee of �8.00. Please order your lunch by Sunday 22nd�May. Seminar fees for BATJ members can be applied for by anyone who has paid the 2015�16 annual membership fee by the time of registration. For information on annual membership, please see our website. The deadline for online registration, cancellation, booking alternation is Monday 23rd May. After this date, no refund is possible. The workshop will involve activities using tablets, PC, smartphones, etc. Please bring your own gadget (those without a gadget are also welcome).